SF State student and Gilman International Scholarship recipient Cameron Angelo is studying in Yokohama, Japan. 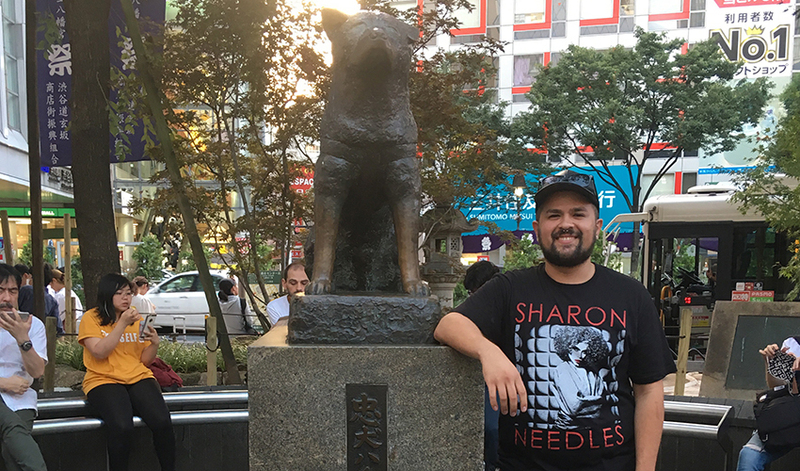 He recently traveled to Tokyo and stopped to pose with the Hachikō Statue. Cameron Angelo left his comfort zone weeks ago. The San Francisco State University student flew to Yokohama, Japan, where he’ll be living for the next year while he studies at Meiji Gakuin University. He’s been obsessed with Japanese animation, food and culture since high school. He doesn’t speak the language, but he wasn’t going to let that stand in the way of fulfilling a longtime dream. Besides, the language barrier is part of the challenge of living abroad, he said. Angelo received one of the 42 Benjamin A. Gilman International Scholarships given to SF State students in the 2017-2018 academic year — the most of any university in the nation. That’s a total of $200,000, divided among individual scholarships ranging from $2,000 to $8,000. The Gilman Scholarship Program supports historically underrepresented students in education abroad, including first-generation college students, students in STEM fields, underrepresented minority students and students with disabilities. The program awards nearly 1,000 scholarships annually to students from 326 universities. To qualify, students must be Pell Grant recipients, a needs-based federal financial aid package, said Noah Kuchins, assistant director of SF State’s Office of International Programs. The scholarship award is in addition to the Pell Grant. “Students can basically double their grant award and it replaces any extra loan they would have to take out,” he said. Equity and accessibility are part of SF State’s study abroad program model — a major reason why the University received more Gilman Scholarships than any other college, Kuchins said. The University is committed to ensuring that the students studying abroad are a representative population. “We have commensurate amounts of underrepresented students — minorities, older students, first-generation college students, students with disabilities,” he said. “We work hard to make sure our study abroad program model meets the tenets of our university: social justice and equity.” The University also worked hard to identify students who qualify for the Gilman Scholarship. “We coach them on the Gilman Scholarship, as well as other scholarships,” he added. Kuchins noted that studying abroad gives students invaluable skills, like empathy, language skills and adaptability, which will make them more competitive in the job market. That’s why it’s crucial the program is open to as many students as possible, he added.